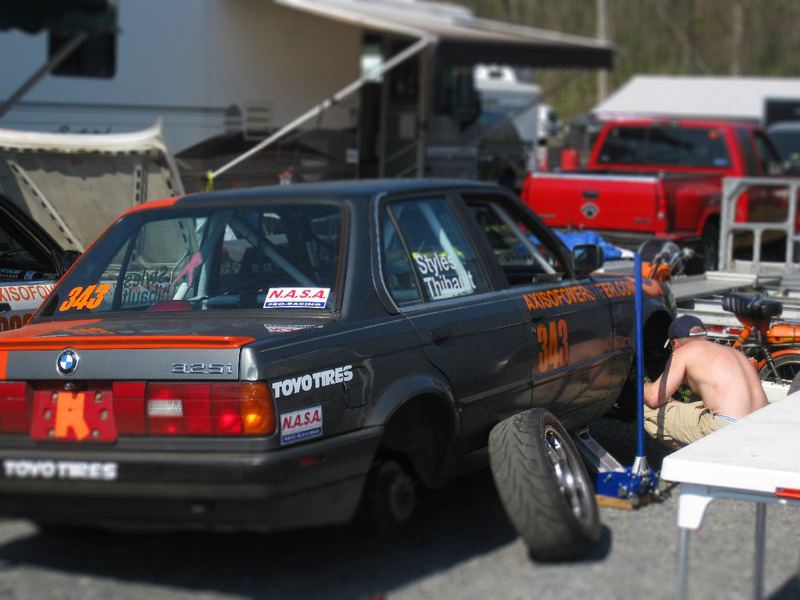 Axis Of Oversteer: Team Axis takes on Spec e30...some more. 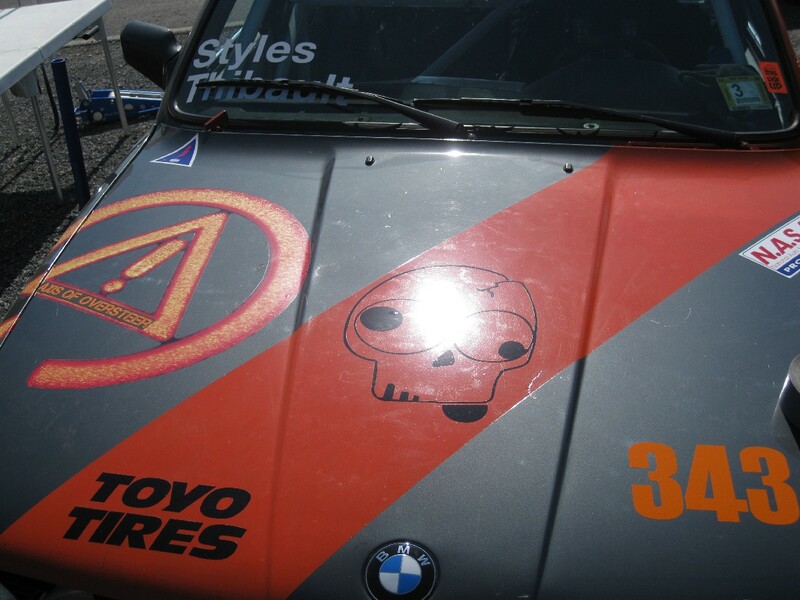 Team Axis takes on Spec e30...some more. 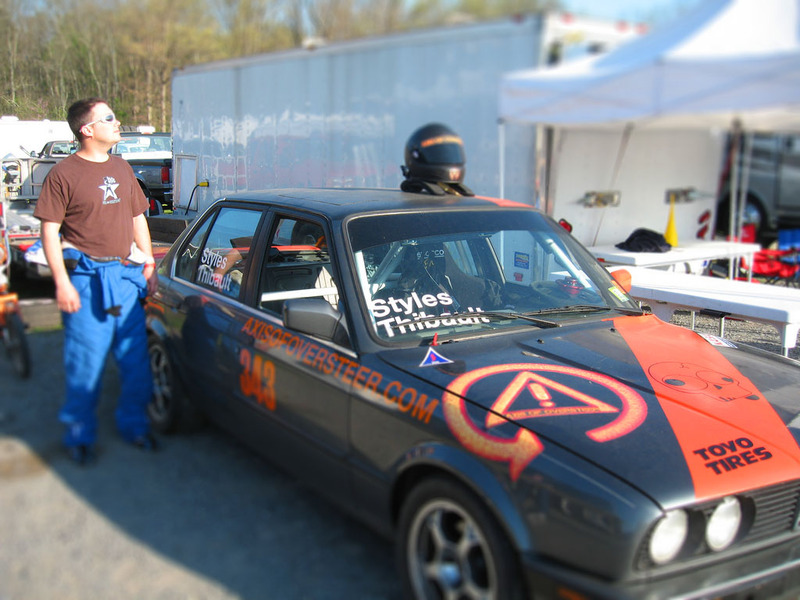 You've read of The Freep's Spec e30 racing here before, now meet Team Axis's latest hotshoe, Pete Thibault. Two weeks ago at Summit Point was his first competition week end, let's hear from him how it went, after the jump. We're driving down to Summit Point, and it starts to hit me, I'm going racing! Pretty nervous about what to expect, but for right now I had other things to worry about. Driving a 38 foot RV with a 24 foot enclosed trailer takes looking ahead on track to a whole new level. After a few hours man handling the steering wheel, we finally make the Summit Point pits. It was close to 9PM but Stee and AC reserved a great spot to park. A quick unpacking and off to tech to get the log book signed off. Passed tech inspection, with a suggestion to put some numbers on the car. I laughed and said it was all under control. Just when I arrived back at our pit, Freep arrived with his whip and, with AC, and myself, started to slap on the graphics on the cars helped by a few beers, pizza and a million southern flesh eating bugs. Some BS, then bed time. Freep and I were the first up. We took the chance to give the 2 cars a final look over before the day started. The warm-up session in my mind was key for this weekend. The last time I had run Summit not in the rain was about 2 years ago. Oh yea and not in the new car. 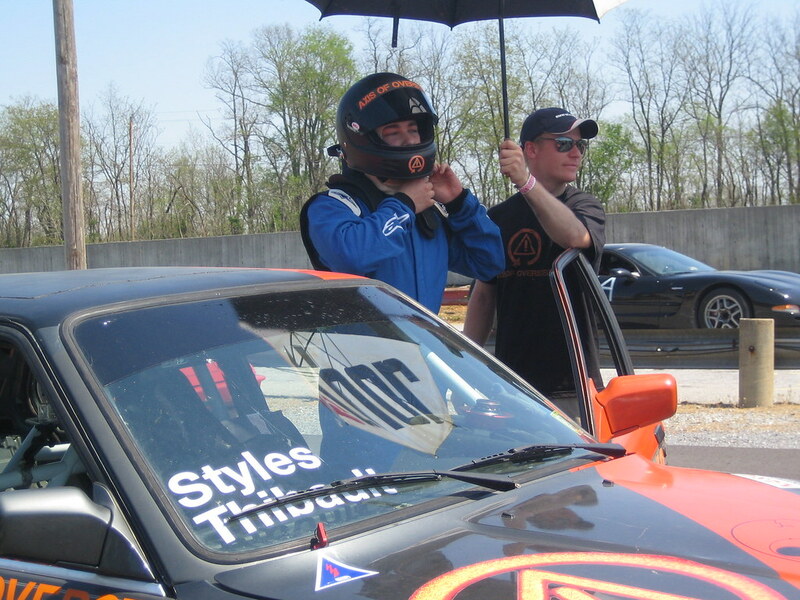 So not only was I a rookie racer but a virgin in this car at this track. During the 20 minutes or so of driving I was feeling pretty comfortable with the car showing a little understeer when pushed hard. 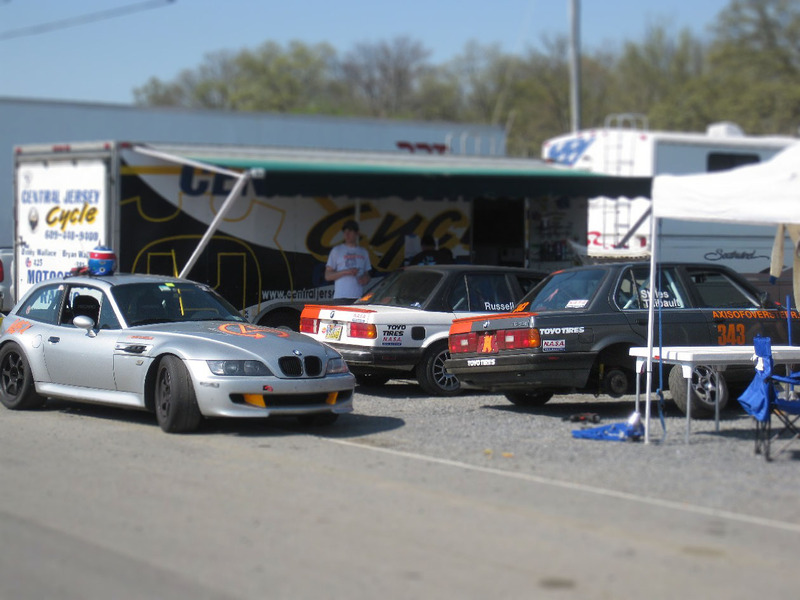 A few of the very fast spec e30 drivers did not run the practice session so i did not have a real good idea how the field would mix up. That rookie brain of mine also had to register the speed difference of the spec 944 cars, very different than Spec e30 . After a quick tire swap and sway bar adjustment andI waited for qualifying. As I clipped on the steering wheel for qualifying the horn would not stop going off. Wow, was this really happening? Gave Justin the wheel to quickly come up with a fix and ended up going out for qualifying slightly later than I wanted to. Pushed the car pretty hard right from the start. The sway bar adjustment made the car feel a lot better. The horn decided to have a mind of its own and always seemed to go off when I was by another car. Not the impression you want to give as a rookie and on the main straight I was trying to rip out the horn wiring. The honking was getting in my head pretty bad and I got pretty sloppy with a slight off track in turn 1 and some very sideways action in turn 10. Just as I was pulling in the pits at teh end of the session, and with everyone waiting to get off pit lane, the horn went off again. I felt like a total dooshbag. After all that I qualified P8 out of 17, about 2 seconds off the leaders time. Race time, I slapped on my gear and headed to the grid early. Little did I know I would be sweating my man junk waiting for everyone. Got a 10 min sign from a grid worker, so i just closed my eyes and used the HANS tethers to get in some quasi sleepy time. Was a little worried about the start, but then remembered what Freep had said to me, "1st corner just get in survival mode, then continue the race". As we were lined up , rolling towards the start finish line, I was trying to look for the green flag and get close to the car ahead of me. Saw the flag but let the guy in front get a little farther ahead then I would have liked. Down the straight I go, while being passed by 2 cars. I over braked into the first corner thinking everyone would slow up, like they did in comp school, but nobody did. I lost about 2 or 3 more spots. Lost 4 or 5 spots in my first thirty seconds of racing but I was through the first corner! Slowly I picked up the pace and started passing some cars in the first third of the race. Had a great battles with Stephen Kapuschany, and Justin Silver. Highlight of the race for sure. I ended up finishing in sixth place. I was happy about how I felt in the car, but sad that it was over. Sunday, an early qualifying then a long wait for the 40 minute race. Had the car inspected by the crew and all looked good. I woke up with a better understanding of what I need to improve on and where and I was ready. In the qualifying session I found a good Spec 944, one that had been running pretty good the day before, to draft. Unfortunately we ran into some traffic, causing some slow lap times. Decided to slow down a little and cool the tires and got some space on track. It worked, I had a great last few laps for P5. Later Robert Allen stopped over to chit chat and informed me that because he was a few pounds under weight, P4 for the race was mine but I was still about 2 seconds off the leaders. This time I pulled the car on the grid and got out to get some air. Talked to a few guys, then it was strap in and race time. Thinking in my head that this first corner will have to be better than Saturdays. On the start I was slightly back from the front row but it was better. Car felt a little sloppy going down the straight and into the corner. At first i thought that I had a lot of rubber buildup on the tires, then it got worse. The culprit? A loose right side wheel , I had to pull in. It was a disappointing problem, but good experience and I learned a few new things. All said and done, raced all weekend, got the car back in one piece and had fun. 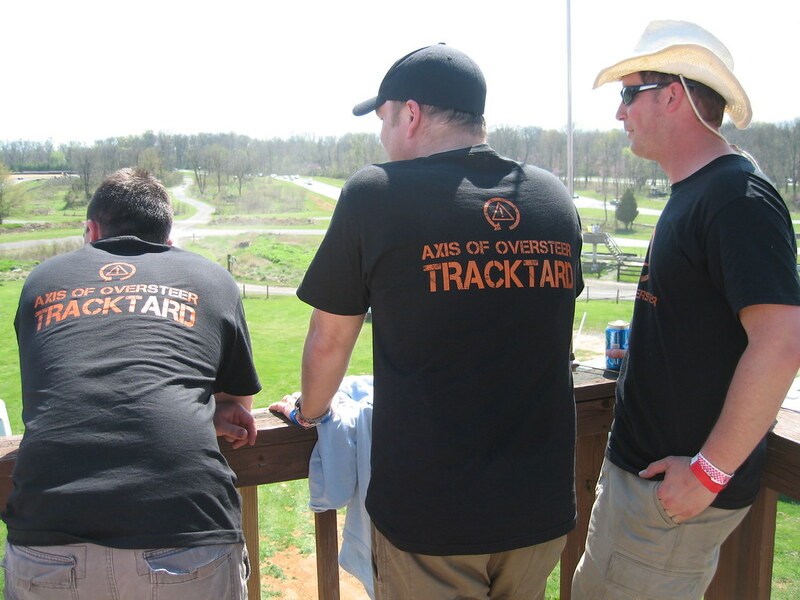 My first race weekend was a great success. Now its time to move on and focus on Hyperfest in June! Good job! Loved the Gun-Ho T10 passes. You had a nice edge on almost everyone on the most important corner! Lap1 T1 is the most important corner of the whole race (in a Sprint). It takes too much work and time through the race to undo any wrongdoing in that first corner.